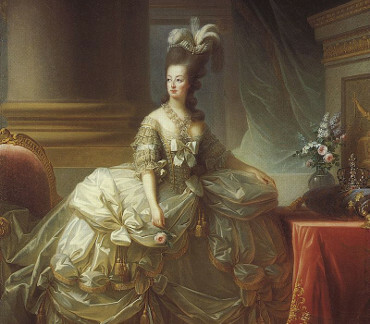 Long after her death, Marie Antoinette remains a major historical figure linked with conservatism, the Catholic Church, wealth, and fashion. She has been the subject of a quantity of books, films and other forms of media. Some of her contemporaries attributed to her the start of the French Revolution. On 21 September 1792, Louis XVI was deposed and the monarchy abolished. After a two-day trial in October 1793, Marie Antoinette was convicted by the Revolutionary Tribunal of treason to the principles of the revolution, and executed by guillotine on Place de la Révolution on 16 October 1793, almost nine months after her husband. Königin von Frankreich und Navarra (1755-1793). Letter with (likely secretarial) signature. Paris. ½ S. Folio. Mit Adresse. Thanking her cousin, Prince Altiéri, for New Year's wishes: "[...] Je ressentirois un véritable plaisir, si les circonstances me mettoient à portée de vous prouver l'estime particulière que j'ai pour vous. Sur ce je prie Dieu qu'il vous ait, Mon cousin, en sa Ste. et digne Garde [...]". - Counter-signed by Pierre Jean Baptiste Beaugeard (1764-1832). Four small incisions along right edge; small blue crayon arrow below the signature. Königin von Frankreich und Navarra (1755-1793). Document signed. Paris. ½ S. Folio. 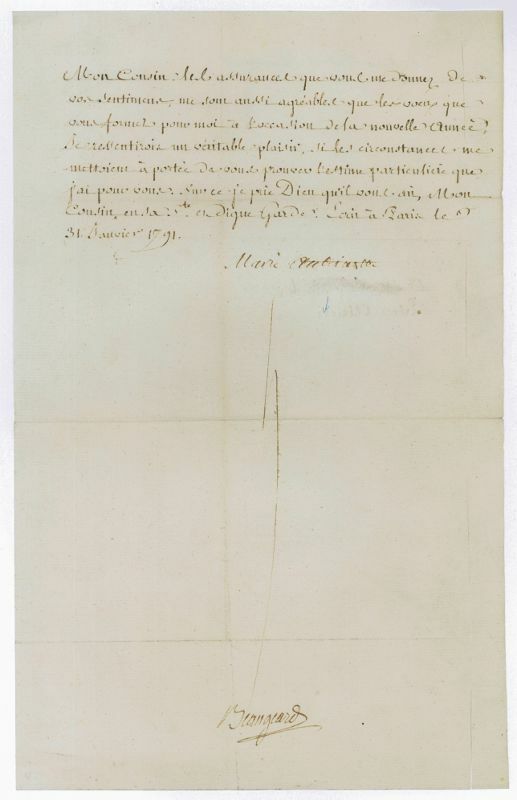 Addressed to the Administrator of the Royal Treasury, responsible for the expenditure of the household, M. Marc Antoine Francois Marie Randon de la Tour, ordering him to "pay in cash to our two valets of the wardrobe the sum of seven hundred and thirty two livres, which we granted them as an additional food payment, in consideration of their service during the year" (transl.). 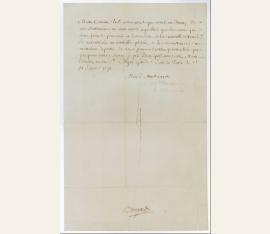 - Counter-signed by Pierre Jean Baptiste Beaugeard (1764-1832). Somewhat browned and spotty. Königin von Frankreich, Erzherzogin von Österreich (1755-1793). Devotional miniature with autogr. inscription signed on verso, with eight additional devotional miniatures, all inscribed and signed on verso by other Archduchesses, mostly by daughters of Empress Maria Theresa. O. O. 9 Bll., jeweils ca. 120:90 mm, sorgfältig unter Fensterpassepartouts in Buch des späten 19. Jhs. einmontiert; starke Kartonblätter, am Ende Inhaltsbeschreibung von Hand des späten 19. Jhs. Späterer Lederband in Schuber. Kl.-8vo. A collection of devotional miniatures of outstanding quality, with dedications to countess Maria Anna von Callenberg, née countess Thurn-Valsassina (1721-86), first lady-in-waiting to Empress Elizabeth Christina, mother of Maria Theresa and since 1757 married to general Karl Kurt Reinicke, count Callenberg. Five of the nine miniatures are by daughters of Maria Theresa and Emperor Francis I (thus uniting five out of eight princesses that survived infancy), one by a sister of Maria Theresa, another by the youngest sister of Francis I, yet another by the Imperial couble's daughter-in-law, and one by an unidentified writer. A scholarly study of the album, published in 1999 (cf. the sources below), praises the "outstanding graphic quality" of the miniatures, arguing that they must have been created by "professionally trained artists" (cf. Feldhaus, p. 19). - All inscriptions are in French or German; they include: 1) St. Cajetan (S. Cajetanus Thieneus), 3-line inscription signed by Archduchess Maria Amalia, Duchess of Parma (1746-1804), dated 1769. 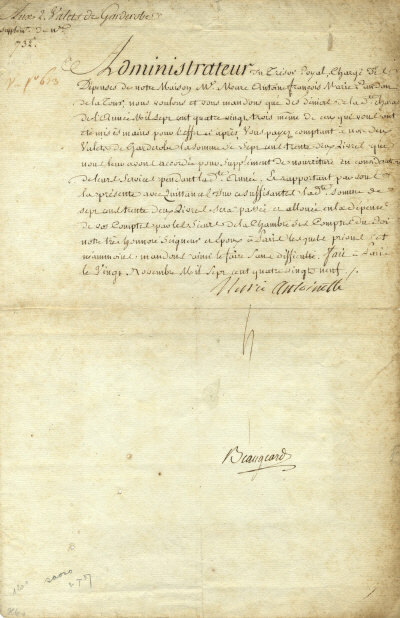 - 2) Charles Borromeo (S. Carolus Borromaeus), 6-line inscription signed by Archduchess Maria Anna (1718-1744), sister of Maria Theresa, dated 1743. - 3) St. Jerome (S. Hieronimus), 6-line inscription signed by Archduchess Maria Josepha (1751-67), dated 1767. - 4) Mother of Sorrows (Mater Dolorosa), 4-line inscription signed by Princess Anne Charlotte of Lorraine (1714-73), youngest sister of Emperor Francis I; undated. - 5) The Virgin and Child ("Du Königin des guten Raths bitt für uns"), 5-line inscription signed by Maria Theresa's eldest daughter, Archduchess Maria Anna (1738-89), dated 1757. - 6) King Stephen I of Hungary (S. Stephanus Rex Hung. ), 5-line inscription signed by Maria Luisa of Spain (1745-1792), Grand Duchess of Tuscany and later Empress as the spouse of Leopold II; dated 1770. 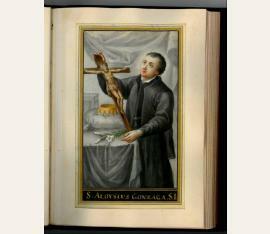 - 7) St. Expeditus (S. Expeditus), signed by Archduchess Maria Elisabeth (1743-1808), undated. 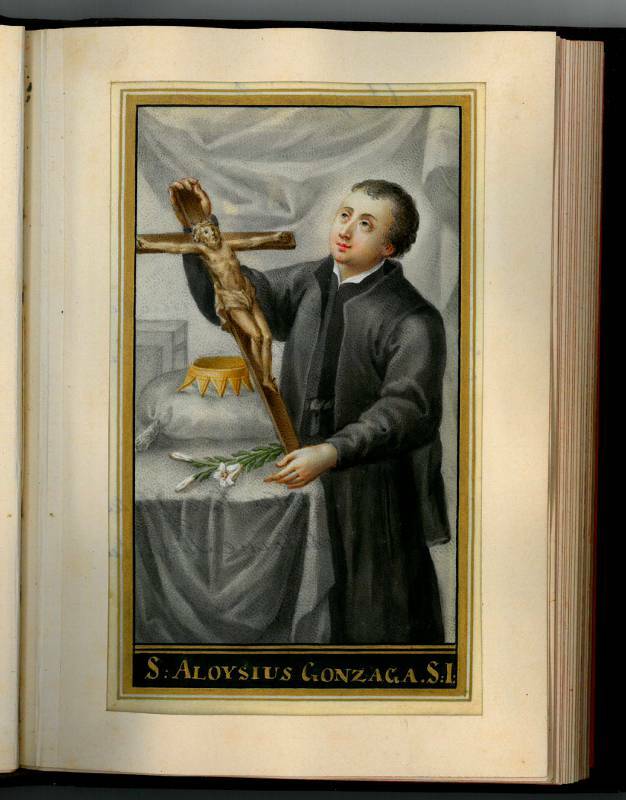 - 8) St. Aloysius Gonzaga (S. Aloysius Gonzaga S. I. 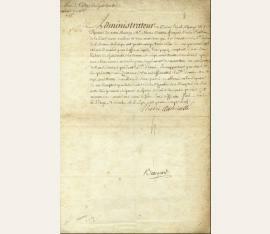 ), 3-line inscription signed by Archduchess Marie Antoinette ("Auspice Deo. En regardant cette image souvenez vous toujours chère Callenberg de Votre très affectioner Antoine Archiduchesse"), dated 29 March 1770, but a month before her fateful departure for France. - 9) Man of Sorrows (Wahre Abbildung des schmerzhaften Heilands auf dem S. Stephansfriedhof), 2-line inscription, undated and unsigned, ascribed to Charlotte von Reischach, lady-in-waiting, by the included index (4to, 4 pp.). - Provenance: count Carl Callenberg (d. 1820), son of the recipient of these dedications; by descent to her daughter Henriette, the last countess of Callenberg (1764-1835), married in 1787 to count Johann Mittrowsky (1757-99), army surgeon to count Lássy's Infantry Regiment; by descent to the counts Mittrowsky; later in the library of the Austrian collector and Keeper of the Purse, count Franz Folliot de Crenneville-Poutet (1815-88), with his collection stamp on fol. 1; sold through the Vienna art trade to a Rhenish private collection in 1969..